The Aislers Set are back! Reissues of the first two albums are available for pre-order from Slumberland Records and the third from Suicide Squeeze. Look for a singles/rarities comp on Slumberland in 2015! There are also some West Coast tour dates to coincide with the reissues (above and on Facebook). Hope to see you there! More info about the tour can be found on Facebook. Linton and Michael of The Aislers Set are playing shows in Europe with The Ladybug Transistor - see above shows for details! This show is an after party for the screening of "Cruel and Unusual." Linton wrote the music for this important new movie about the struggles trans people face in the criminal injustice system. Friday June 9, 6PM at the New Festival in NYC. For tickets, go to www.newfest.org. Has it really been a year since the last post on this site? There's rumour of the machine getting into some sort of gear. Hopefully we'll have a fruitful April. Magic Marker Records has released a comp entitled "A House Full of Friends" which includes an unreleased song by The Aislers Set recorded by Amy pre-Terrible Things Happen. There are many good bands and friends included and the booklet & packaging are wonderfully done. Click here to order a copy. Possible new record out sometime late 2005 or early 2006. Thanks for your patience. If you are in the Bay Area come check out Still Flyin's first show at the Hemlock Tavern: Thursday Oct. 28th, doors at 10:00 PM. Still Flyin is Reggae and includes Wyatt, Yoshi, Alicia....as well as members of Track Star, Masters of the Hemsiphere and Red Pony Clock. Chck out our keyboardist Dan's other band, Scrabbel, at the Athens Pop Fest on August 6th, with our friends Boyracer. Don't miss Camera Obscura on their first tour of the United States. Supporting them in Los Angeles is Mystic Chords of Memory (w/Jen Cohen) and supporting them in San Francisco is Remedy 'n' Wren (w/Alicia Vanden Heuvel). Four new songs added to the Media page. We've expanded the Press section, have a look! Our former keyboardist Jen has a beautiful record out with her new band Mystic Chords of Memory out on Rough Trade. 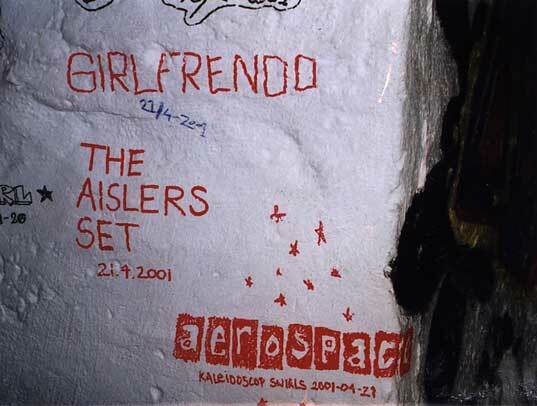 The Aislers Set is currently writing music and will have a new record out sometime in early 2005. Go see Australia's Architecture in Helsinki on their first tour of the United States, you'll be floored. New T-shirts are available for ordering. Some MP3s have been added for your listening pleasure. The lyric sheet to our first record, "Terrible Things Happen", is finally up. No shows or touring for a long time. Thanks to The Shins, Broadcast Oblivion and Greg Brown for the week of drinking in the Midwest. We will no longer be playing two shows with The Shins in Colorado; the first show of the tour will now be in Minneapolis. Sincere apologies from The Aislers Set. Thank you to everyone for the past 2 months of tour, most especially Yo La Tengo and crew, Kim Grassie, Sage, Issac C, Aerospace, Love is All, Erase Errata, Luis and Montse at Elefant, Lucksmiths, Price, Robin at Luger Booking. The Aislers have recorded a live appearance on P3 Pop Radio, Sweden (English version here) which will be up on the Swedish Radio site until this Monday, the 27th, so have a listen to hear how the European Tour is going! The band starts playing at around 17:30 into the first part of the show. There are a couple of you who drove a long ways from Southern Florida to come see us play in Gainesville and Jacksonville this past March, if this is you, please email us. Two final U.S. dates sans YLT will be added soon; we're talking about somewhere in Michigan and Oklahoma. We're working on a short European tour that starts in mid-October, that info in the next week. Hi. We're excited to have been invited to support Yo La Tengo on their fall tour. Tickets are already on sale for some of the shows: Brooklyn, North Carolina and Orlando. Four or five more dates with and without Yo La Tengo will be added very soon. Out now: "Frisco Styles," a beautiful CD document of San Francisco put together by Chris Johanson and friends out on Deitch Projects. Over 40 bands on this including Vetiver, Erase Errata, The Quails, Tussle and Tommy Guerrero. Your local record store may have it; if not, you can order online from Aquarius Records. We're excited to have been asked to perform at "Tinkle" on July 13th. Tinkle is a music/comedy/variety show that takes place Sundays at Pianos in the lower east side and is hosted by David Cross, Todd Barry & Jon Benjamin. We will be performing a few songs acoustic. 21+. 6 Dollars. Hand-Stamps at 7:00 pm. No advance Tickets. Admitted on a first come basis. No dice on the Philadelphia show. We're playing a benefit show in San Francisco this Monday, June 16th with proceeds going to the the Indonesian Mural Project & Art Exchange. The D.C. show on the 11th is confirmed and we have also added one more show with an up and coming artist, Yo La Tengo, at The Fillmore in San Francisco. Our luck continues. "The Walk" as taken from "The Last Match" is included on "Kitestringing: The Prison Literature Project Benefit". Each month the PLP sends out nearly 2,000 books to prisoners nationwide all proceeds go to help this valuable cause. Other bands included are Young People, Tribe 8, spoken word from Noam Chomsky and many others. "Hey Lover" as taken from the Slumberland single is included on the wonderful London based Track and Field Organisation's "Pow! To The People" comp. Every artist on this record is fantastic...included are Ladybug Transistor, Comet Gain, Dressy Bessy, The Tyde, The Clientele, James William Hindle and so many more. If any of you video recorded or audio recorded a show on our last tour or in the past, we'd love it if you could send it to us. Please email us. We added one summer NYC date; we will only be playing two other shows nearby, and they will be announced real soon. Alicia and Kid Frostbite (AKA Mike Schulman of Slumberland Records) will be doing a DJ set at The Parkside this Thursday as part of the Noise Pop Festival. It'll be free and beer is cheap. Thursday, February 27, 12am-2am. 1600 17th Street (at Wisconsin). On FEBRUARY 26TH you can join a massive march on Washington without leaving your living room. That day every Senate office will receive a call every minute from a constituent, as they receive a simultaneous flood of faxes and e-mail. Hundreds of thousands of people from across the country will send the collective message: Don't Attack Iraq. Every Senate switchboard will be lit up throughout the day with our message -- a powerful reminder of the breadth and depth of opposition to a war in Iraq. Faxes are very easy and phone calls are the most effective. To register to send a free fax and make phone calls to Senate offices and the White House, visit: www.moveon.org/winwithoutwar. Updated some tour changes...no shows in Providence or Buffalo but one added show in Northampton with Mates of State and the location added for Nashville. THERE WILL BE WORLDWIDE PROTESTS AGAINST THE POSSIBLE WAR IN IRAQ ON SATURDAY, FEBRUARY 15th (SO AS NOT TO CONFLICT WITH THE CHINESE NEW YEARS PARADE, IN SAN FRANCISCO IT WILL BE HELD ON SUNDAY, FEBRUARY 16TH). FIND YOUR CITY. After three years, "How I Learned to Write Backwards," our follow up to "The Last Match," is being released. The CD version on Suicide Squeeze is out in stores today. The LP, released on Slumberland Records, will follow in a week or so. Both versions are also available through direct order from the respective label sites. In Europe, the CD/LP will be distributed by Cargo UK and will be out in independent record stores Feb 18th, 2003 and in the chains on March 10th, 2003. The Australian version, on Lost and Lonesome Records, will be out on Feb 17th, 2003. The Japanese version with the bonus tracks of "Clouds will Clear" & "Campanas de Mision," out on ULF Records, will be released some time in March 2003. Pre-Orders are being taken for the CD of "How I Learned to Write Backwards" at the Suicide Squeeze site. All Pre-Orders will ship on Jan 31st (Airmail for Intl. ), ahead of the Feb 11th release date. "How I Learned to Write Backwards" will be released in Japan by ULF records. "How I Learned to Write Backwards" will be out Feb 11th, 2003, CD format released by Suicide Squeeze and LP format released by Slumberland. In Australia the CD will be released domestically on the Lost and Lonesome Label. We are also working on domestic releases in a few more countries and will let you know very soon. We will be touring the United States this coming March & April and we are excited and fortunate to announce that all shows will be with The Quails and selected dates with Hella. Dates, venues & cities to follow sometime early next year. Also we have all sizes of Aislers Set / Chris Johanson shirts in stock (Sizes are Child's Large - Regular XL). The Misson Bells 12" is available for pre-order; records will be shipped out to you Nov. 4th. Suicide Squeeze will release a new 12" single featuring the songs "Mission Bells," "I'm So Glad to See You Go" and "Campanas de Mision." The release date is set for mid-November and the single will only be released on vinyl, with the CD version following at a later date. 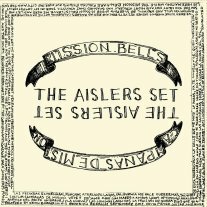 "Mission Bells" is from our upcoming record, "How I Learned to Write Backwards," which is set for release the first week of February 2003 on Suicide Squeeze and Slumberland Records. Tickets for the CMJ show are for sale. Walk up tickets can be purchased at Earwax/Other Music this weekend. We have set up a separate page for ordering T-Shirts with all the information you need to do so. Shirts for sale. Designed by our friend Chris Johanson. Shirts are black and the sizes are XL, L , S, Youth L (Sorry, no mediums left). The cost is twelve dollars which includes shipping and handling. Allow one to two weeks for delivery. Email aislersset@yahoo.com for ordering instructions. Wednesday July 24th, Amy will be playing a set with Mary Manning as The Friends at the Hemlock Tavern in San Francisco around 10 P.M.
Wyatt and Track Star are on tour once more with The Shins. Group the Movie opens in New York City on July 5th at the City Cinemas East Village, two songs from The Last Match are featured in the movie. Shot with an improvised script the movie revolves around nine women involved in group therapy, Carrie Brownstein from Sleater Kinney plays one of the women. The Amos House/Wishing Tree and Fields and Streams/Kill Rock Stars compilations are available for order. Wyatt and Track Star's new record "Lion Destroyed the Whole World" is out now on Better Looking Records. We will have some T-shirts available for sale in a few weeks. 555 Records has repressed LP's of The Last Match on white vinyl. Two added Canadian shows with Belle and Sebastian. We are very happy to announce that we will support Belle and Sebastian on three dates during their East Coast swing. Dates are up above. Unfortunately, two of the three shows are already sold out so we hope most of you already have tickets. These will be our only shows during this time. Wyatt and Track Star will be touring the United States before and after the Belle and Sebastian shows. Here are dates for Jen and The Fairways' Japanese Tour. Selected dates will be with Mirah and Dear Nora. We'll also have another brand new one "Through the Swallows" out May 7th on the KILL ROCK STARS "Fields and Streams" comp. This will be a double CD and will also feature the likes of Erase Errata, Comet Gain, Stereo Total, The Quails, Gene Defcon, Deerhoof, Mary Timony and many, many more amazing artists. Again, our deepest apologies for having to cancel the tour. Hello all... we are very sorry to say that we are cancelling our NY shows and our Southwest tour due to ilness. We'll let you know if the shows get rescheduled. Again we're very sorry and hope those of you who had planned to see us can understand. In other news, for a complete listing of our discography visit our page at Kill Rock Stars. We've been recording songs for the next album and hope to have it for you sometime in the Fall . The next record will be a co-release with Slumberland pressing the vinyl and Suicide Squeeze pressing the CD. We are all very excited and feel blessed to to be working with two amazing labels. We've posted some new dates up above including two shows so far in the NYC area. Look for a Fairways Japanese tour in April and a Track Star U.S tour from mid-April to May. We are going to begin recording the next record towards the end of January. A profile of the band will be in the new issue of the European magazine "Dutch". December 1, Pomona, The Glasshouse with Majestic and Le Coupe 8:00 P.M.
December 2, San Pedro, Sacred Grounds Cafe with Rizzo and Katie the Pest 8:30 P.M.
Alicia and Poundsign will be on a brief tour of the East Coast. The San Francisco Weekly Music Awards - vote. Wyatt and Track Star will be on tour around the United States from Mid October till Mid November. Buy Wyatt a drink. There will be a re-broadcast of the session we did for John Peel on Thursday July 19th, you can listen to it live at 2 P.M. PST. Leaving on Sunday to Portland, Hello Powells, added show info for Olympia. Our new "Red Door" single is now available from Slumberland. Our show as part of the San Francisco International Popfest is on sale now thru Ticketweb, it was suggested to us that tickets be purchased in advance online. Starting today, Spin.com will air the acoustic session we did with them last December. Four songs were taped, including "Army Street" and "Clouds Will Clear". Hello, venues for our Northwest tour with the Ladybug Transistor and the Lucksmiths will be confirmed soon, it's looking like June 11th -13th. The Red Door single on Slumberland should be here any minute now. The Red Door single on Fortuna Pop! is out on that side of the world, over there. There are slight differences in the two releases, with a different tracking on vinyl and the size of the drawing on the cover. It's fun, get both, you deserve it. The song "Attraction, Action , Reaction" will be on the soundtrack called "Charm," a movie by Sadie Shaw and Sarah Reed, which is out this month on the label 5 Rue Christine. The Amy Linton also has a piano piece on the soundtrack. This soundtrack will be good. The tour diary is trying to update itself. We are going to be broadcast on the John Peel show Tuesday, April 10th from 10 P.M. to 12 A.M, which is from 2 to 4 P.M. for West Coast America. You can listen to it live on the Internet via BBC Radio 1. Our show in Paris is confirmed and it will be on a Pirate Boat that's parked on the Seine, very cool. This will be our only show in France. Another show is to be added in Brighton and we're still waiting on that one but we think it's on the 6th of April. There will be a tour diary/notes of sort that we hope can be updated regurarly. You can view it here. For those of you wondering our John Peel Session is to be recorded on April 1st and to be played back on Mr. Peel's BBC show at a later date, we'll let you know when as the BBC is broadcast live via the internet. The folks at the Strange Fruit, stress that you get there early on April 14th to be assured entrance. There is a also a downloadable coupon on their site which takes a pound off the admission. Our plans for when we get back from Europe include a quick jaunt up to the Northwest with The Ladybug Transistor and The Lucksmiths. Those dates will be posted as soon as they are confirmed. We will also be doing a show or two in and around the Bay Area with Black Dice, Erase Errata and Avey Tare & Panda Bear sometime in late May. Adj? Hello, we've added some more shows to our Europe dates, one in Glasgow, one in Newcastle, England and a few in Sweden. We should have the rest of the dates all up by the end of the month. Our friends at the clothing store Wednesday and Proud have produced & stocked Rebecca Pearcy bags featuring The Aislers Set/Fairways 7 inch records. The bags come in two styles, Truckette and Small Record Bags . Prices are $39 for the Truckette and $31 for the small record bags. Please email or call (415.551.0725) Wednesday and Proud if you are interested in placing an order. They take Credit Card orders or you can visit the store in the Hayes Valley area of San Francisco. You can buy the Australian version of The Last Match at the Slumberland store now. Lastly, our second record has been nominated as Best Debut by the California Music Awards. "Winners" are chosen through internet voting by the "fans". Be assured that those of us attending the ceremony will be hobnobbing at the open bar with the best of 'em alongside the likes of Metallica, Los Lobos, Counting Crows & Blink 182! We are very jazzed that we will be embarking on our first European tour come this April. We've listed some of the confirmed shows and countries, look for more shows around the UK and Scotland. We are also playing some local shows, one being the San Francisco Noise Pop festival. This will be the 5th year that at least one of us has been involved in this event. Also, look for a write up in the new issue of Alternative Press issue "Top 100 bands to look out for in 2001," we are amongst some good company. The Suicide Squeeze single will be out in stores the week of Feb. 19th, but you can pre-order it from them now. For a limited time you can order the Fortuna Pop! "A Christmas Gift from Fortuna Pop!" CD from insound.com. In other news, our poor van was stolen last Thursday night, drunkenly crashed a few blocks away and totalled. On a positive note we've salvaged the stereo we just bought last month...Have a nice December holiday. We have added a page for listing all of our past shows. Our tour was fantastic, in 3 weeks we've played with some of our favorite bands and hung out with some of our favorite people. We are indebted to all the wonderful human beings in Bratmobile, Tennessee Twin, The Go Betweens, Aden, Comet Gain, Girlfrendo, Toulouse, Sportique, Boyracer II, Kevin Pedersen for all his hard work and Stevie Jackson for singing The Walk with us at Slim's. We'd also like to thank the wonderful people of Southwest Airlines at Islip who held the plane we were late for as we ran across the airport to catch it. But we'd also like to give a big thumbs down to them for cancelling our connecting flight to Oakland from Kansas City and having to make us layover a total of 7 times in our round trip. While in New York we did a live acoustic session with spin.com (including the songs Army Street, The Walk, Clouds will Clear, Red Door) look for it in a few months. The very nice folks there also included us in their top 20 records of the year, look for a video interview with some of us in the coming week or so. We've also gone and recorded a holiday song, "The Snow Doesn't Fall," that is included on a CD from Fortuna Pop! "A Christmas Gift from Fortuna Pop! ", it's available through them, write - FP, Flat 3, 37 Oakdale Road, Streatham, London, SW16 2HL UK and enclose ?4 sterling. You can now order the Fairways/Aislers Set split for a limited time through the Slumberland site. The new Beikoku Ongaku from Japan features our song "The Way to Market Station" on the CD, the CD in this issue also features songs by Dear Nora, CAR, Electric Birds and more. It is very, very cold here in San Francisco, we leave for tour soon and our van does not have heat...But we can count our blessings that we are getting a "killer" Sony tape deck with (count em') two front speakers installed by our friends at the Mr. Good Guys this Tuesday. The Aislers Set/Fairways splits are done and sound great, they should be in your record stores in the next few weeks. We will have some for sale on our upcoming mini-tour. The Australian version of "The Last Match" on the Lost & Lonesome label is also done. This edition features a special cardboard jacket and we will hopefully have more info on ordering it on this or the Slumberland website. The folks at Slumberland have started accepting credit card orders via Paypal, so you can order everything through them. The Fairways/Aislers Set split was almost finished the other week, we had 500 stuffed and ready to go, but realized in horror that our side of the split was warped and wobbley in a few parts due to a manufacturing error (damn you)...back to the press! After about a year and a half since we first recorded the songs, it'll be just another few days till it sees some light. It really looks fantastic though, Adrian's cover art is a real beauty and everyone liked it so much we made posters of the cover and included them with every 7 inch. We've been told that John Peel has been playing a few "cuts" off "The Last Match" and doing a little research on his archives we found out he really did...absolutely amazing, I tell you. If you by chance have a copy of any of the following Peel shows: 9/14, 9/19 or 10/12 please, please send them our way. The Japanese version of "The Last Match," which was released on Oct 27th, contains a bonus cd with the entire first record "Terrible Things Happen" and a bonus track of "Fire Engines". It also features lyrics for both records and retails for 2835 YEN (that's about 25 bucks to us Yanks). We'll try to include some sites where you can purchase them if interested. The Aislers Set/The How split single is out on Slumberland/555 records. Check your local record store or visit the Slumberland website. Please visit the Slumberland website to read recent interviews and recent press about the band and "The Last Match"
"The Last Match" was released in the US on May 8, courtesy of our friends at Slumberland Records. Vinyl copies are out in the UK via 555 Recordings of Leeds, and CD copies are out courtesy of Fortuna Pop! There is also a limited edition Australian CD that will be released on Lost and Lonesome, Mark from the Lucksmiths' label. The Japanese version on Minty Fresh Japan is also out now. See a brief video interview with us that was filmed by Insound in April while we were visiting NYC. For those of you who were unable to get a copy of our wedding single split with Poundsign, here is an MP3 version of the cover we did. Our tour diary of Japan in Zum is out now and for sale. If you would like to contact The Aislers Set by mail, it can be done via Slumberland at P.O. Box 19029, Oakland, CA 94619.